Chef's Kitchen: Full size refrigerator, freezer, dishwasher, gas stove, ice maker, beverage cooler, tons of storage space. Living Space: Spacious seating for 6-8 people with 32" Television (DIRECTV) system. Day Head and Bedroom #2 - Queen size bed, closet, drawers, and 32" Television. 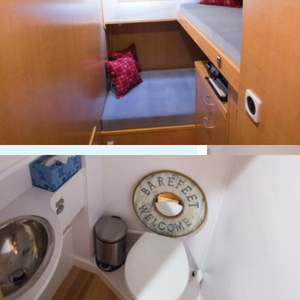 Includes Bunk Beds & plenty of room for everyone!